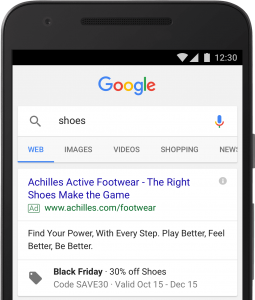 There’s a barrage of new features coming to Google Ads to help advertisers get their advertising campaigns ready for Black Friday and the Christmas online sales rush. Promotion extensions have been tested in Google Ads for about a year but they are finally rolling out globally to all advertisers using the new Google Ads interface. Promotion extensions help advertisers to create special offers and discounts without needing to create brand new adverts. These are particularly useful for seasonal sales as the promotion extensions can include a percentage off, a promotion code and a validity period. There are also 12 occasions to select from including Black Friday and Back-to-School, to help your adverts stand out even more. It’s not just ad promotions that will help you reach your target audience. The new ad variations feature lets you test text advert changes across your whole account at scale. Using ad variations you can test out new headlines across all your adverts to promote seasonal events, special offers or lightning sales. Let’s just say that you want to promote a winter sale by having this displayed in your headline, with ad variations it’s really easy. You just create a new ad variation where you change Headline 1 for all your ad groups and campaigns or select the ones that you’d like to apply the changes to. Once you’ve made the changes you’ll be able to measure the performance and see results as soon as they’re statistically significant. It’s not just seasonal promotions and events that ad variations can be used for. These also offer a great way to create new adverts in bulk to test new headlines that could help your business. All of these changes are aimed to make the new Google Ads experience more appealing to advertisers and get more people to switch over to the new interface. If you haven’t yet made the switch then now could be the time to start getting used to the new interface if only to access the new features.